PES Select Protein is the highest-quality protein nutrient, which combines whey protein and casein increasing the amino acid level in blood and satisfying the needs of growing muscles. 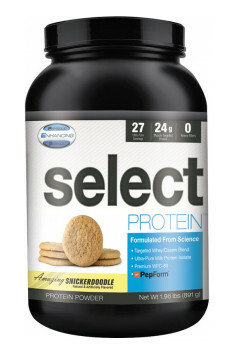 The product contains 24 g of whole protein (milk protein isolate and whey protein) in one serving. Despite large amounts of proteins, a product dose contains only 1.5 g of fat and less than 1 g of carbohydrates, which is why it is also suitable for people on low-carbohydrate diet. The nutrient is water soluble, gluten-free and very tasty. Protein is digested in the stomach, then it reaches the duodenum and the intestines, where it is absorbed. The enzymes that are involved in protein digestion vary in their complexity – there are macromolecules, polypeptide chains and amino acids. Also, the digestion can take place in a variety of ways, depending on the molecule decomposition and the place where it is absorbed. This product contains casein and whey protein in the form of an isolate and a concentrate, which are various proteins with different ratio of digestion and absorption. There are some benefits from such a composition. Scientific research proves that casein causes a smaller increase in the concentration of amino acids in blood than whey protein, while the increase maintains for longer (about 7–8 hours). In turn, whey protein allows for a rapid increase and in amino acid level, but it is shorter (2–3 h). Application of the above mentioned proteins in the form of an isolate and a concentrate enhances this effect. The concentrate is absorbed more slowly than the isolate and thus the isolate shows anticatabolic properties. Supplementation with the nutrient rapidly raises amino acid level in blood and maintains it for a long time. Such solution is very convenient for every athlete who cares about a steady increase in muscle mass without fear of a sharp drop in the supply of amino acids needed for muscle cell growth. Proteins have many important functions in the human body system. They play a role of the main building material of tissues and organs, enable biochemical and immune reactions, transport many substances and optimise hormone functions which affects the whole body system. For this reason, it is important to provide whole protein with food. As the product contains casein and whey protein, it is a complete source of all essential amino acids (EAA) and branched-chain amino acids (BCAA). Branched-chain amino acids, including valine, leucine and isoleucine, are a group of amino acids that significantly improve the regenerative capacity of muscle tissue. They positively affect reduction of post-workout fatigue and show anticatabolic properties. In turn, essential amino acids make up a much wider group which includes also branched-chain amino acids. They cannot be synthesised by the human body, which is why they need to be provided by the proper diet. Combining casein and whey protein in the product results in additional benefits. After reaching the stomach, casein forms a clot, which reduces hunger. As casein prolongs the release of amino acids, it is worth to apply it in the evening, so that it can show its anticatabolic properties also during sleep. Whey protein, especially in the form of an isolate, allows for a rapid increase in amino acid level. For this reason, it will be perfect during and after spontaneous training. After an intensive training, whey protein will quickly complement amino acids which are necessary for muscle regeneration and growth. What is more, this protein slightly increases insulin level, which is an anabolic hormone used as a performance-enhancing agent in bodybuilding. Insulin reduces blood glucose level, as it transports the substances to cells and provides them an energy substrate for ATP production. To sum it all up, PES Select Protein is a perfect source for whole protein, especially for people who value a quick and long increase in amino acid level. A combination of casein and whey protein makes it unnecessary to use two separate products with the same effects. The supplement is then a convenient nutrient which contains 27 servings in one packing. One scoop (dissolved in glass of cold water) take 2-3 times a day. Use the same as on workout days. Supplement intended both for people building muscle mass, as well as reducing excess body fat. I recommend to use especially after training or before bedtime, because it will protect muscle tissue against catabolism and initiate anabolic processes. To increase the anabolic effect, creatine supplementation may be a good idea. PES products are dietary supplements and supplements designed especially for athletes. From thic company you can buy natural supplements that increase testosterone levels in the body, as well as high quality pre-workout supplements. In their offer are also available products accelerating the fat burning and dietary supplements enhancing the growth of mass and strength, increasing energy and accelerating recovery time. Complete support for bones, joints, cartilage and ligaments.